The first historical information regarding the castle and the church of Giomici goes back to about the year 1100. The history of the church is closely tied to the history of the city of Gubbio, which controlled the castle. In remote times the parish church of Giomici, under the name of San Marcello Papa, was situated outside the fortified walls in the locality now called San Marcello. Another church named San Biagio depended upon this church. In consequence of a donation (1163) made by the Emperor Federico Barbarossa, these two small churches belonged to the monks of the Abbey of San Donato in Pulpiano of Gubbio for a long period of time. Irish monks founded this abbey, now destroyed, in the 8th century. Unfortunately, the two small churches of San Marcello Papa and San Biagio came to ruin, but thanks to the generosity of the Counts Coccorano and to Giomici it was possible to build a new church inside the walls of the castle on property conceded by the counts; a residence for the parish priest was also constructed there. As it's well known, the counts of Coccorano, noblemen from the city of Gubbio, owned 1/6 of the territory of Giomici. The original church was constructed adjacent to the circle of the antique walls; the entrance, however, was on the side, as is still evident today, inside the castle. In relatively recent times, the main room of the church took on its actual rectangular form and an external façade was created in line with the castle wall, crowned by a small bell-tower “a vela” with two bells; on the new front a new entrance door was opened towards the valley. In 1937 the façade was restored and a new bell-tower was constructed in which 4 large bells were placed; the old bells were transferred to the Barcaccia church. The church is dedicated to San Michele Arcangelo; this fact is probably related to the tradition of associating the churches that are situated on the borders of the diocese to the protective warrior archangel of the Christian faith. In fact, Giomici is located on the extreme border of the Gubbian territory and in front of the cities of Assisi and Perugia, historical rivals of Gubbio. 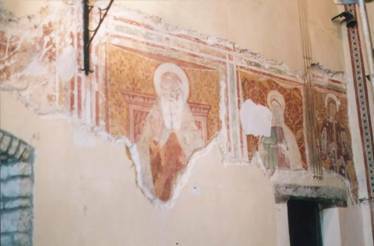 The church contains interesting fragments of frescoes on two of its walls; at least three of these (an annunciation, a S. Michele Arcangelo and a S. Sebastiano) are attributed to the well-known painter Matteo da Gualdo (1480 ca). 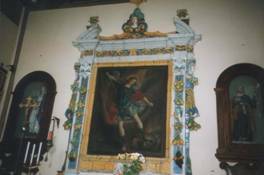 The other frescoes are examples of votive paintings by vagrant artists of the Umbrian school, and a representation of S. Atanasio at the pulpit as the protective saint of Giomici. The reason for which the frescoes were chiselled is not very clear, they were partially removed and re-covered with paint containing lime; this deplorable intervention was probably due to false sanitary reasons because in past epochs it was believed that wall paintings could contain in their cracks the germs of many illnesses. Recently these frescoes have been, as much as possible, restored. For more than a hundred years this church was the Vagni family's burial place. However, the custom was abolished during the first years of 1800 when, with the promulgation of the Napoleonic codes, it was prohibited to bury the dead inside places of worship; a small plaque at the bottom of the left wall of the church records this fact. 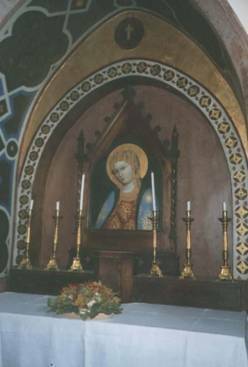 On the right wall, in the area where the antique entrance door with a pointed arch was located and is still evident, is located a “Madonna” on a small altar, copy of a noted work by the Gubbian painter Ottaviano Nelli. Recently, a Roman sacrificial altar that was found in the area of Giomici has been positioned by the left wall. The ceiling is made of painted wooden tiles placed on a frame. A wooden chorus balcony was constructed on the main entrance wall about 80 years ago. An antique baptismal font in wood is situated on the right side of the present entrance. The most interesting part however, in an artistic profile, is the polychrome ceramic frame in majolica above the main altar that is attributed to the famous ceramist Antonio Biagioli, called “Il Monina”, of Gualdo Tadino. The solemn artwork in a baroque style of unique dimensions (maximum measure cm. 280 x 450), was presumably made under the care of the Brotherhood of the Holy Sacrament, recognized by the Bishop of Gubbio and installed in the church of Giomici in 1601. All this can be explained by the fact that the antique lay society wished to embellish its places of worship with important works of art; therefore the purchase of the opera can very well be attributed to this Brotherhood. The idea of this artwork is very refined, not very sacred and almost pagan. The composition is an authentic symbol of the fertility of the earth and the fecundity of life. There is total freedom of interpretation; observe the woman, dominated by the cross at the summit. The image is similar to a pagan goddess. Most interesting in a botanical sense is the presence of fruits and vegetables of the period: lemons, pears, zucchini, cucumbers, grapes, leaves, etc. With the exception of the loss of a bunch of fruit on the lower right side that has been substituted by a recent copy, the state of conservation is excellent. In conclusion, this work of art is an exceptional testimony of what important work was produced in 1600 by the ceramic factories of Gualdo Tadino The majolica frame encloses a modest painting of 1600 that is a copy of the S. Michele Arcangelo by Guido Reni, the original of which is conserved in the Vatican museums in Rome.